COSTA MESA, Calif. /California Newswire/ — LendingQB, a provider of seamless mortgage lending technology, announced that it published the availability of a free white paper designed for lenders that are considering replacing their loan origination system (LOS). The paper addresses the challenges lenders face when evaluating mortgage technologies and outlines a strategy to assess their existing technology weaknesses, identifying areas for improvement. Entitled "The Five Steps to Making Better Technology Decisions," the white paper recommends conducting an Enterprise Process Assessment (EPA) of lending operations and workflows. According to the paper, all too often lenders buy technology predominantly based on features, failing to perform a critical deep dive analysis of their workflow to effectively model and measure process enhancements using standards and best practices. The white paper stresses that before buying technology, lenders must establish an objective, well-defined, comprehensive process in order to overcome the many challenges associated with complex technology evaluations. Executing an EPA provides a clear understanding of and roadmap for how to select technology that reduces cost per loan, improves profitability, maximizes employee productivity and decrease the number of manual touch points throughout the workflow. * How to reduce cost per loan and increase profitability. Interested parties can download the free white paper from LendingQB's website at www.lendingqb.com. LendingQB is a Costa Mesa, California-based company that specializes in loan origination technology solutions and services for the mortgage industry. 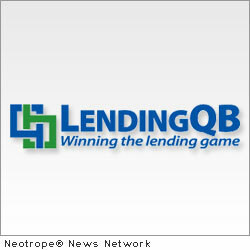 The LendingQB LOS is a 100 percent Web-based, true end-to-end enterprise-class loan origination platform. The solution is designed to meet the needs of all types of mortgage lenders-large or small, wholesale or retail, correspondent or Internet-based-with specialized tools that are targeted, customizable and flexible. LendingQB uses a consultative technology assessment approach before engaging with new clients, and places a strong emphasis on the utilization of data analytics to assist lenders in leveraging business intelligence, resulting in optimized organizational performance and lowered cost per loan. For more information about LendingQB, please call 888-285-3912 or visit www.lendingqb.com.